President Vladimir Putin is on his way to India to discuss a gas and arms deal. Last week, he was in Turkey talking about diverting what was to be a South Stream pipeline away from Southern Europe to Turkey. At the APEC summit, he was squaring off deals with China for oil and gas. It is clear that Russia is pivoting to Eurasia. Here to discuss all of this is our regular guest Michael Hudson. Michael Hudson is distinguished research professor of economics at the University of Missouri-Kansas City. His latest books are The Bubble and Beyond and Finance Capitalism and Its Discontents. You’re right. Since the last time we talked, which was almost a month ago, the entire world’s geopolitics, its trade patterns and its military alliances, have radically changed. And as you point out, most of this is because Russia has given up on Europe and reoriented its oil and gas trade, and also its military technology and its military alliances, towards Eurasia. Last week, President Putin gave a speech saying there was no point in his talking to the European leaders anymore; he was going to go to the people who pay them, the United States. He said, as long as they take their advice from the U.S. administration, he might as well pay for the people who are–talk to the people who were controlling them. And that’s what he’s doing. So the result of these changes is the opposite of what American strategy was based on for the last half-century, the idea of dividing and conquering Eurasia by setting Russia against China, by isolating Iran, by preventing India, the Near East, and other Asian countries from joining together to create some kind of alternative to the dollar area. 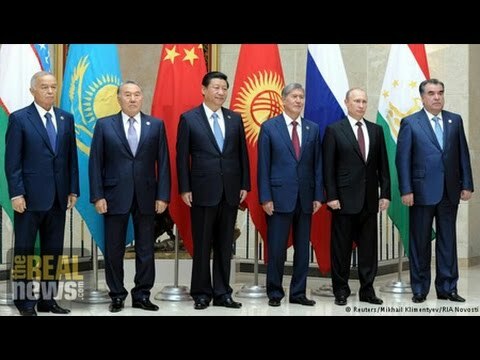 In fact, the American sanctions and the new Cold War policy of the neocons are driving these Asian countries together, in association with the Shanghai Cooperation Organization, as an alternative to NATO, and the BRICS are trying to make an alternative to dealing with the dollar area and with the IMF and the World Bank that represent U.S. policy. So, regarding Europe, America’s insistence that it join this new Cold War policy by imposing sanctions on Russia, and especially by blocking Russian oil and gas imports, is–aggravated the Eurozone’s austerity, and it’s just turning it into a dead zone. And, a few days ago, a number of German leading politicians, diplomats, and cultural celebrities wrote an open letter in the newspaper Excite to Angela Merkel protesting her pro-U.S. policy and saying that America’s NATO policy and the new Cold War, it threatens just to wreck not only the German economy, but to split up Europe. So, instead of integrating sort of American power and breaking up the rest of the world, Europe and Asia, American policies overplayed its hand and is actually driving all of the rest of the world in a defensive alliance to what they look at as a danger of war. The whole idea of NATO was supposed to be to protect Europe for more. And now, with all of its saber rattling and its offer of heavy weapons to the Ukraine, NATO’s putting Europe in military danger. And this is just–it’s reversed a whole half-century of American foreign policy. And there’s been no discussion of what’s happening in the United States. Yeah, as you point out, Turkeys already moving out of the U.S.-European orbit by turning to Russia for its energy needs. The South Stream pipeline has been redirected away from Southern Europe to Turkey. Iran is also moving into an alliance with Russia, not only for oil and gas, but for atomic energy and for weaponry and becoming a participating member in the Shanghai Cooperation Organization. And now, as you pointed out, India is negotiating trade. So instead of really hurting Russia, the sanctions have convinced Russia that they have to be independent of manufacturing, independent of Europe, independent of importing food needs from France and other European countries. The result has been to cause a disaster for Lithuanian farm exporters exporters /ˈfrɛntʃɑr/ exporters and others who were looking to European market, to the Russian market. And, in fact, the whole last 20 years, ever since the end of the Soviet Union, the whole idea was to bring Western Europe and Russia together into a market. America has broken that up. Well, what this does is reverse everything that you’re taught in the political science textbooks. The textbooks say that countries shouldn’t have enemies or friends; they should simply have national interests. America said to Europe, forget your economic interests; you have a friend in us. That means you do what we tell you. You have an enemy in Russia. That means that you have to give up your hope to import oil and gas in Russia, give up your hope of exporting manufacturers in food to pay for this oil, and turn to us. It’s sort of a dream that is technologically impossible, because there simply are no facilities to deliver enough American gas and oil to meet Europe’s energy needs. So the whole neocon strategy of trying to bluff Russia is in danger of backfiring. The basic idea was very narrow. I think the Obama administration saw that Russia wanted to turn to Europe ever since the Sochi Olympics. President Putin was talking about a closer alliance with Europe. But then Putin opposed the Obama administration’s plan to attack Syria. And this led the neocons to say, okay, we’ve got to attack Russia, and the best way to attack it is to pry Ukraine away. And either that’s going to provoke a Russian invasion, and we can then say, look, Europe needs NATO, you have to depend on us, and the condition is you have to turn against Russia, or else it’s going to just drag Russia down, it’s going to cause the currency to collapse, and Putin will become unpopular, and finally we can get the regime change we want–we can get another Yeltsin in there instead of Putin. PERIES: But, Michael, the U.S. strategy, as you said, the Cold War strategy, isn’t it partly working here as the sliding oil prices will certainly constrain the capacity of Russia to extend the way they want to? Also, isn’t it so that the ruble has taken a dive? So what does all that mean in terms of–. HUDSON: The ruble has indeed taken a dive. But this has not affected the Russian economy very much, because the Russian economy operates on rubles, not on dollars. Putin over the last two years has moved to make the ruble independent of the dollar, just as China and other countries are making their currencies independent of the dollar. So the effect now is that, yes, Russia has fewer dollars, but it doesn’t need dollars because it’s re-denominated its foreign trade in rubles, it’s re-denominated them in Chinese yen. So the Russia-China trade, the Russia-Turkey trade, the trade of all of these non-dollar countries is taking place without dollars. So there’s really no need, particularly, for dollars at all. The effect of the ruble falling is to increase the price of imports to Russia. And so Russia’s response has been, okay, if we have to pay more for our food, then we’re going to subsidize our own growing of food. And Russian farm output has been rising very rapidly to replace the imports that it was making from Lithuania, from France, and from other European countries. Putin was also saying, now we’re going to begin to subsidize our manufacturing. We cannot depend upon the Germans, the French, or the Europeans for their manufacturing. We’re going to depend on China, on Turkey, and most of all on our own manufacturing. And the sanctions against Russia have actually proved to be a godsend, because it enables Russia to do essentially what it would have liked to do but couldn’t do under international law: to subsidize and protect its own industry. And in these speeches that President Putin gave last week, he said, we now realize that we have to turn away from Europe, that Europe is basically part of Rhode Island in the United States, and we’re just going to subsidize our own industry to the point that we’re self-sufficient in essentials, so that it doesn’t matter what the ruble does, it doesn’t matter what the dollar does. We’re putting together our own banks clearing system as an alternative to the U.S. system. We’re putting together our own currency swaps with other countries. So, essentially Russia and the rest of Asia have been insulating their economies from the United States, just the opposite of the U.S. strategy of trying to make them more dependent on the United States. PERIES: Michael, with the falling ruble and the controls that the sanctions are having, and also in terms of the sliding oil prices, doesn’t this grossly reduce the capital power that Russia has, particularly in terms of these new trade deals they’re negotiating? Isn’t there large sums of capital necessary to build pipelines and implement the trade deals that they are negotiating at the moment? HUDSON: The capital to build the pipelines takes two forms. One, it takes the forms of domestic currency. And Russia’s central bank can create enough rubles to defray all of the domestic costs. Russia doesn’t need dollars for domestic ruble costs. And the rest of the costs will be supplied by China. And instead of the Europeans or the Americans making this deal and the other raw materials for the pipelines, China’s making all of this. And China’s providing this on credit. And in exchange for the credit that China and other countries are providing, they’re taking their payments in future oil and gas. So, essentially, Russia’s–doesn’t need the dollar credit and it doesn’t need financial credit. It’s making a currency swap that it’s paying off in future oil and gas deliveries. So what America believed to be a threat turns out to be a paper tiger. It’s a paper financial tiger, something that has almost zero effect on Russia. PERIES: Right. Michael, I thank you for joining us, as always.